The Tamworth and District Civic Society (TDCS). The Tamworth Civic Society, the conservation, planning, environmental, local history and heritage organisation for our area since 1973, sadly became dormant in later years, and so it was re-launched on 22nd September 2015 as The Tamworth and District Civic Society. 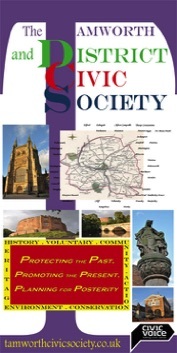 The new title emphasises that the civic society, as always, serves both Tamworth and the surrounding villages in Staffordshire and Warwickshire. TDCS hopes to build on the past achievements of Tamworth Civic Society, and to again provide our district with a strong forum and community voice on planning, environmental, and heritage issues. If these are of interest, please consider joining us - details are under "Membership".